Ronald Reagan once said you can tell a lot about a fellow's character by his way of eating jellybeans. A lot of people will be eating them on top of 400 pounds of chocolate birthday cake in celebration of his 100th birthday this weekend. 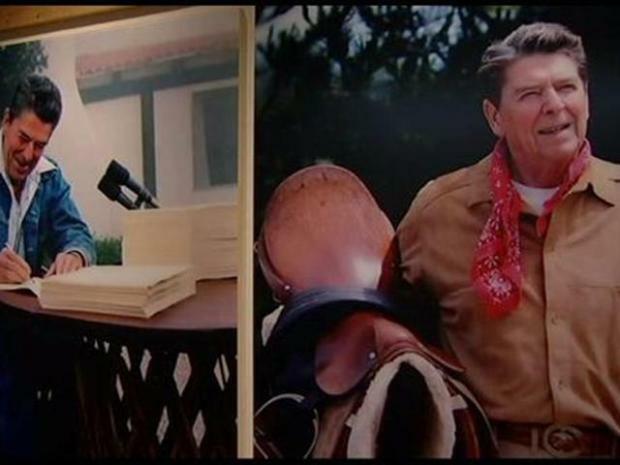 The official Ronald Reagan Centennial Birthday cake is under construction, and it is impressive. Four Seasons Westlake's pastry chef David Laufer is heading up a team of 10 who will, in the end, spend close to 160 hours baking and crafting this five-tier masterpiece. During the brainstorming sessions on what the cake would look like, Laufer says, he became a student of all things Ronald Reagan. "I did; it's funny," he says. "I Googled what his favorite flavors were and what his favorite items were." Reagan's Cake is 400 Pounds. Cakenomics: 100 lbs. of flour, 200 lbs. of sugar, 120 lbs. of butter and 400 eggs = The Ronald Reagan Centennial Birthday Cake. Turns out, chocolate cake is the favorite of the Great Communicator. In fact, he loved birthdays so much, he always had an emergency chocolate cake aboard Air Force One, in case anyone who happened to be flying with him were celebrating one. There's even a replica chocolate cake in the Air Force One that's parked at the Ronald Reagan Presidential Library and Museum. The centennial birthday cake will be covered with licorice jelly beans on the top tier, a 50 pound chocolate eagle perched on top. One-hundred stars and stripes will alternate on layers with the Seal of the President of the United States, the Seal of the State of California, and the Seal of the USS Ronald Reagan on one layer, and edible photographs of Reagan through various stages of his life on another. Getting the 400-pound cake to Simi Valley will be "challenging," says Laufer, but the layers will be transported in pieces and constructed on-site. As far as cutting and serving the cake? That's what the 1,650 cupcakes are for. Every guest at the Sunday gala will get a chocolate, chocolate chip cupcake with a white chocolate Presidential Seal on vanilla butter cream.